It's amazing and important to remember that while as parents we tend to notice the big baby milestones - rolling, crawling, sitting, standing, walking - our babies have been practicing and acquiring skills which form the building blocks of these skills for all the weeks and months leading up to them. In the months leading up to your baby learning to roll back to belly (a milestone commonly achieved in the 4th or 5th month), your little one will begin working on tucking his chin toward his chest - what child development nerds like me call "neck flexion". He'll begin this skill usually before he can bring his feet high enough off the floor to look down and see or reach them and even just before he can hold a toy well above his chest (at the "midline" of his body) to look at. This chin tuck movement requires neck strength and flexibility and will become one of the initial movements your little one will use to initiate rolling. By rolling a towel to lift the hips a bit, you may be able to help your little one see his feet with colorful socks or foot rattles on them. You could also achieve the same effect by propping baby's feet against your body or against a soft chair or thick nursing pillow. This one comes naturally to most parents, but strategically positioning your body and face so baby begins to gaze downward to see you gives her sensations of a new head position and makes this activity new all over again! If you've read CanDo Kiddo for long, you know I LOVE activity gyms and frequently recommend strategic toy placement from them to help promote head turning in babies (to help prevent Flat Head Syndrome / Plagiocephaly and Torticollis). Three to four months is a great time to start hanging toys over your baby's belly and feet. Not only will she be motivated to practice the new skill of tucking her chin, she'll also likely start working on bringing her hands together and kicking her feet - other important skills of this age range. Learn more about activity gyms and how to choose the best one for baby. Placing a soft toy on baby's chest can hold his attention for quite a long time at this stage. If your little one wears sleepers with snaps, you can try my trick of snapping a stuffed toy to hold it in place (see photo above). This is a favorite CanDo Kiddo activity, but one that also scares a lot of parents (we've always been told that babies + balloons don't mix, right?). You can substitute Mylar balloons instead of latex and you don't have to tie them to baby's feet to tap into the new chin tuck skill she's working on. Tie them to a doorknob or piece of furniture and position baby on his play blanket with feet pointing toward balloons. You must CLOSELY SUPERVISE this activity (eyes on baby within arm's reach). And as with all baby activities, if you're not comfortable with it - don't do it. You know your baby best. 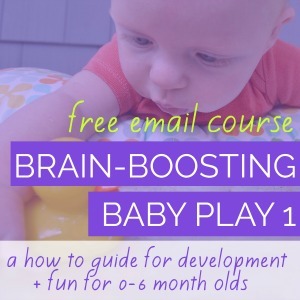 Need More Ideas For Developmental Play For Your New Baby? Is your creativity zapped by sleep deprivation? 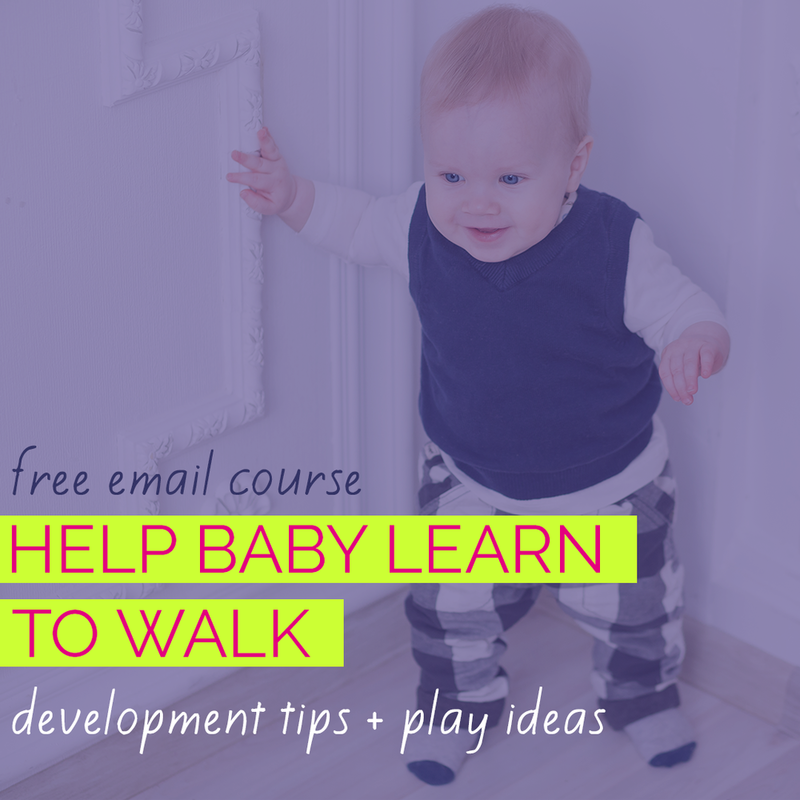 Do you struggle to know what to do with your baby to promote healthy development? 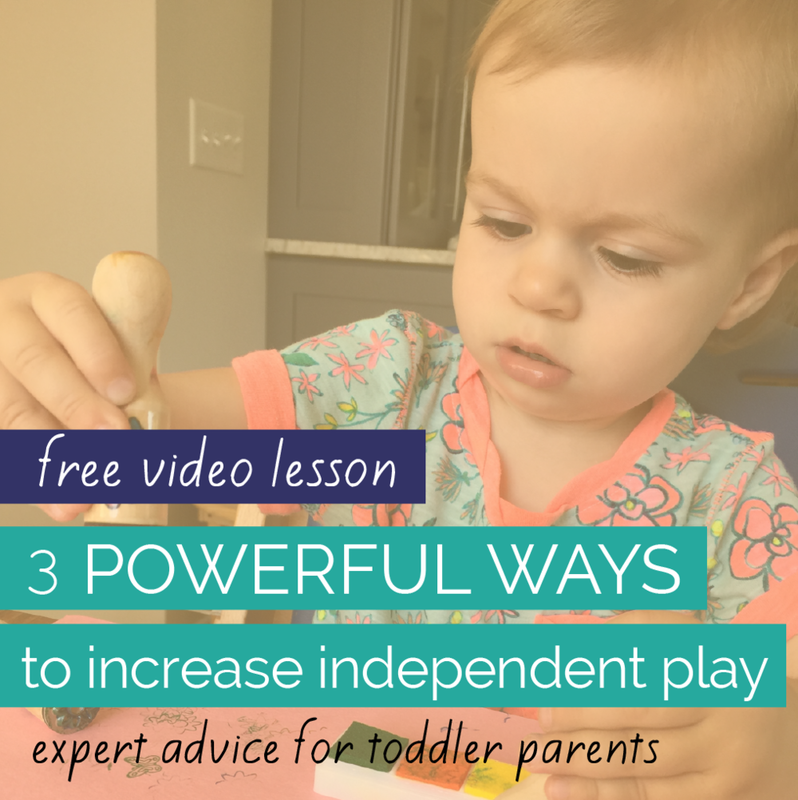 Here's your expert guide - featuring 45 simple ways to play with your infant plus how they can make your little one smarter and stronger. "A must-own for new parents. Easy and creative activities for playing with your baby." "A super fun book that my daughter and I have enjoyed trying activities from every day. I only wish I would have ordered it sooner!"